Our Summer 2017 Nike Needs! Summer is prime for tennis so enhance the experience by filling your need for Nike! Major inspiration for their Summer Collection 2017 features a lot of color combos and cuts for clay court season, including the French Open. Cool, new colors are Paramount Blue, Vivid Purple, Ghost Green and Tart. So if you love the looks of Serena, Maria, and Azarenka, stay tuned. World class sports apparel is your equipment and should only better your game – and with new, Nike you get just that! 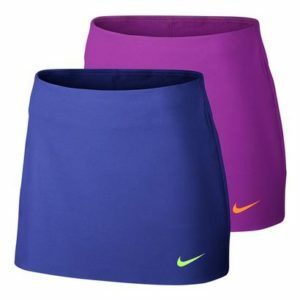 I love the perfect fit of the Court Power Spin 11.75″ Tennis Skort. New colors are beautiful and bright in the sun. Regular and long lengths are available for your preference. The fit is ideal for players who like compression in their skirts. The waistband is important because it clings tightly but is smooth and breathes on your hips. 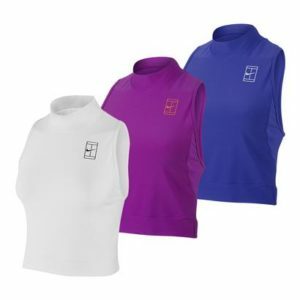 It’s a fitting, sleek design that is supportive and comfortable because of Dri-FIT, plus sweat wicking, capabilities. I’m a fan of the inner waistband because of my short torso and of course the pocketed inner short. Way to do it Nike! The little details on this dress can bring a smile to any match!! It’s the Pure Premier Tennis Dress in Paramount Blue or Black. I would basically wear it all day before the courts. It’s flattering and functional – because of course it’s sweat wicking! So play on! A high racerback design means you can play fearlessly and look just as fierce. It’s a close call to a summer dress. Keep stylish with a V-neck and swing for that forehand freely in this sleeveless piece. So have fun and get creative on the court in this printed dress from the Nike Pure line. Stay tuned to the French Open to see Nike’s summer collection on men’s, women’s, and team’s tennis. Don’t forget that Nike has new shoes and visor colors to match your favorite summer outfit!